KINGMAN—Children stand with their bicycles they won during the Kingman Masonic Lodge No. 22’s 12th Annual “Books For Bikes” giveaway that was held at the Kingman Sears store Saturday, May 26. Two students were unable to attend the actual bike giveaway ceremony, but they will receive their bikes at a later date. The students were from Black Mountain, KAOL Intermediate and Middle, Cerbat Elementary, Cedar Hills, and Manzanita schools. The children read books and presented book reports on them. Each student received one entry into the drawing for each book they read and another entry if they prepared a book report. At the end of the reading competition, the names of the winners were drawn randomly from the container containing the entries. Attending the ceremony included (rear – left to right) Kingman Masonic Lodge No. 22 members Terry Warnicke, Buffalo Hayden, Jed Holley, Byran Sawyer, Ken Chism, Garon Young and John Hansen, and Havasu Masonic Lodge No. 64 Charlie Dower with Zoey (who is training to be a support dog at Shriner’s hospital), along with Kingman Sears Store Manager Steve Gambrel(third from Left). 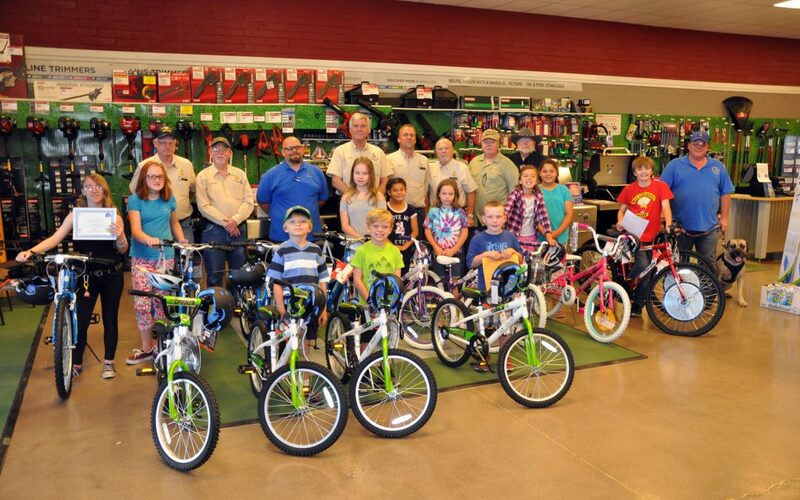 the Masonic Lodge purchased the bicycles from the Kingman Sears at a reduced price and the 14 bicycle safety helmets that were also given away were purchased by the Kingman Shrine Club. The Sears employees took time out of their busy schedules to assemble the bicycles for the Masonic Lodge.